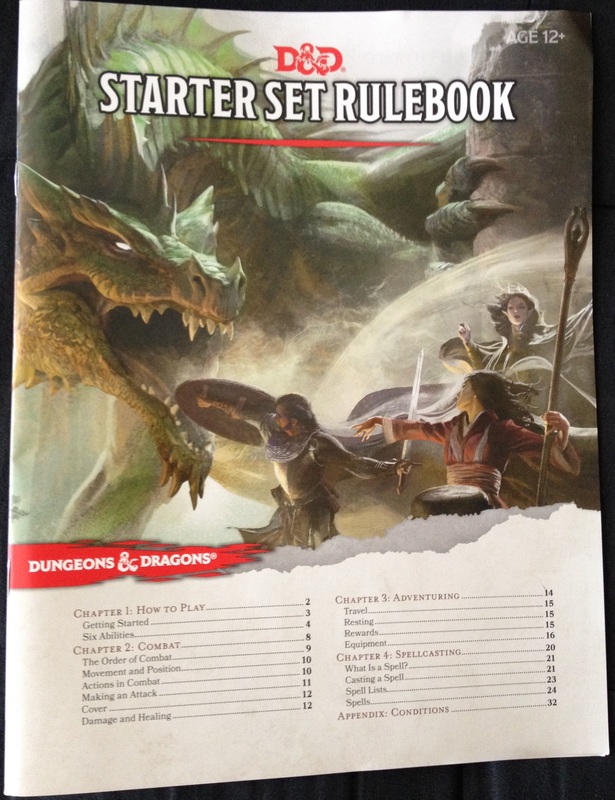 An advance copy of the D&D Starter Set arrived at my front door just in time for the Fourth of July. Although it will take me a while to write up a review of the whole piece, along with some more specific looks at the rulebook and enclosed adventure, I thought many of you who will have to wait until July 15th would enjoy a quick photo heavy unboxing piece on the package. You can click on each photo in this piece for a larger view. You’ll also have to excuse the quality of these shots. I am far from being a professional photographer and I was doing this with both naturally shaky hands and an iPhone. Ready to see what’s inside the D&D Starter Set? Let’s take a look! First up: The unopened box. I love the art. It reminds me of my original red box from back in they day. 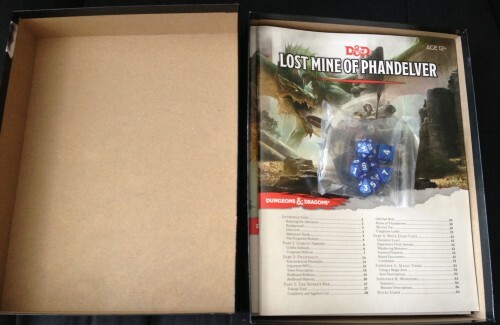 Once the lid is off, you can see the box is full of books and dice. The books are soft flimsy covered similar to the adventures released for The Sundering, but the page are of high quality and everything is full colour. Not bad. 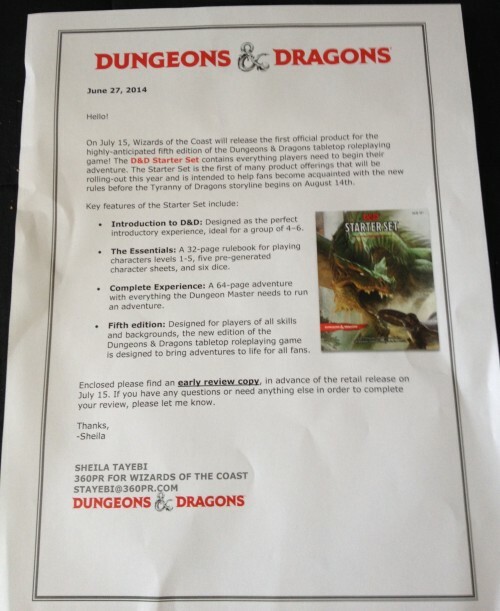 Here’s the letter from Wizards of the Coast’s external PR firm telling me what I’ve been sent. If you’re ever lucky enough to deal with Mark or Sheila over at 360, then you know there’s extremely nice folks and very helpful. I’m not just saying that because they send our site D&D and Magic: The Gathering stuff either. 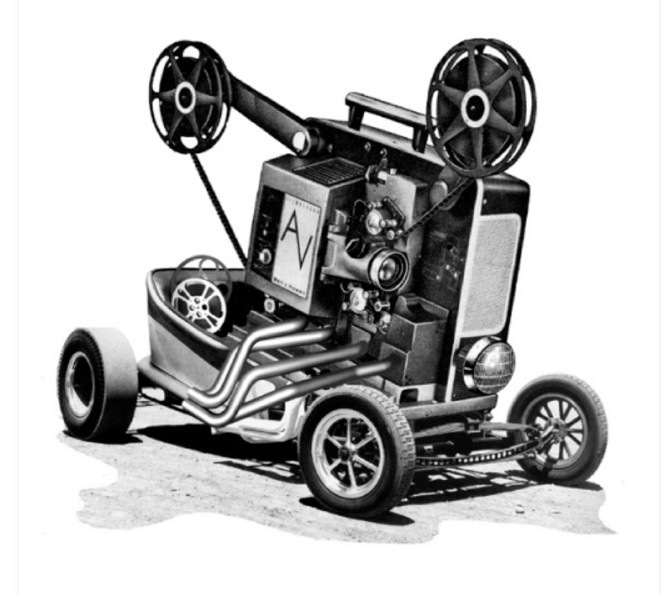 I did however think some of you would find the official letter to reviewers interesting as it’s not something you see very often unless you’re on this side of the industry. 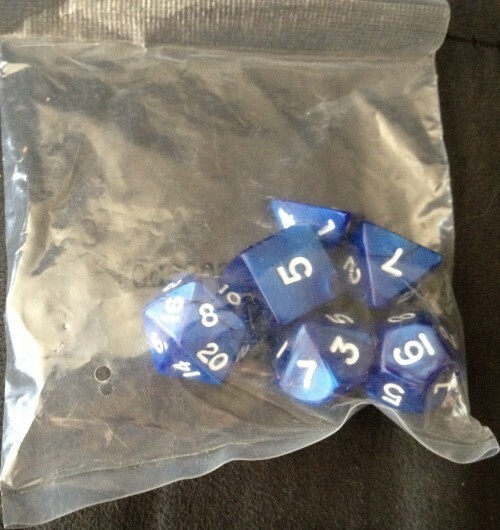 A close up of the bag of dice that comes with the D&D Starter Set. We all like dice, right? Here’s the cover to the Starter Set Rulebook. As you can see, it also serves as a table of contents. 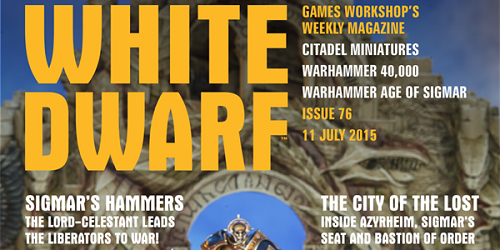 It’s over thirty pages long and should be all you need to start in with Fifth Edition. Of course, if you have any of the D&D Next releases, you can use those to further flesh this set of rules out. A look at one of the pieces of art from inside the Starter Set Rulebook. A look at some of the spells from 5e. As you can see from the large version, magic is even more powerful (some might say unbalanced) than in previous editions. Yes, Burning Hands does do 3d6 damage as a first level spell. Good bye Magic Missile as the most useful starter spell for a new wizard, eh? This is the cover (and table of contents) to the starter adventure, “Lost Mine of Phandelver.” I’ll do an in-depth review of the adventure before the official release of the D&D Starter Set, but as you can see, it’s a pretty big adventure. It’ll take your characters from Levels 1 through 5. 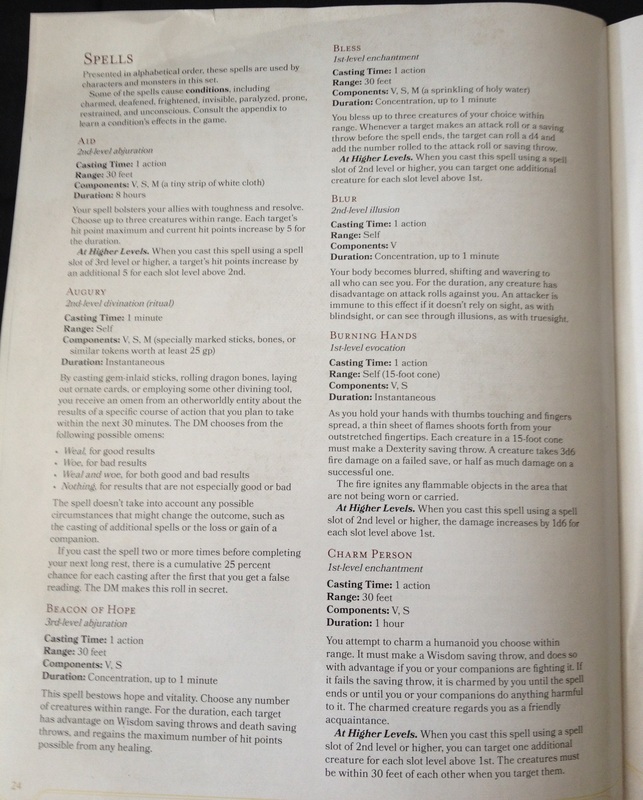 The book also contains a short Monster Manual and list of magic items and weapons. Nice! This is the front of a character sheet for one of the five pre-generated characters for the D&D Starter Set. I chose the Elven Wizard because I thought it would be the most interesting to you. 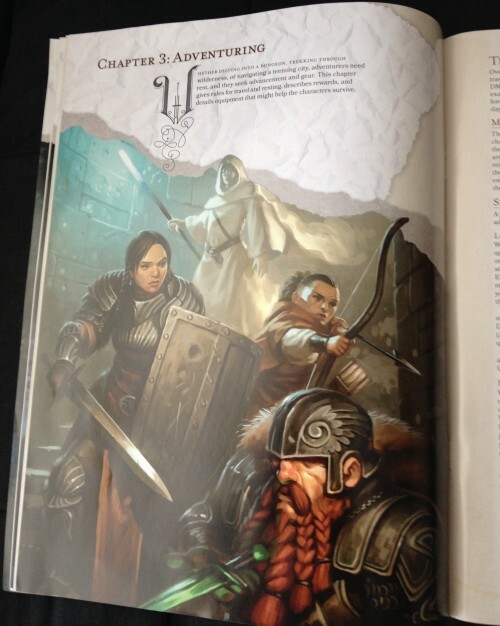 The other characters are two human fighters, a halfing rogue and a dwarven cleric. 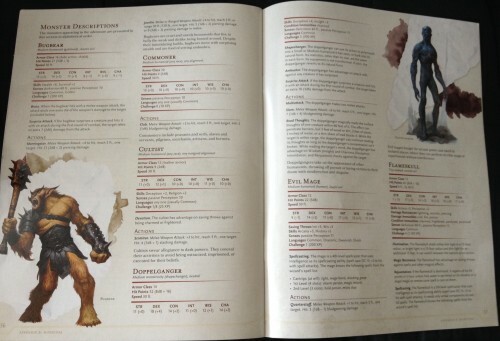 The two human fighters showcase how similar and yet different a fighter can be in 5e. We’ll take a look at that down the road. 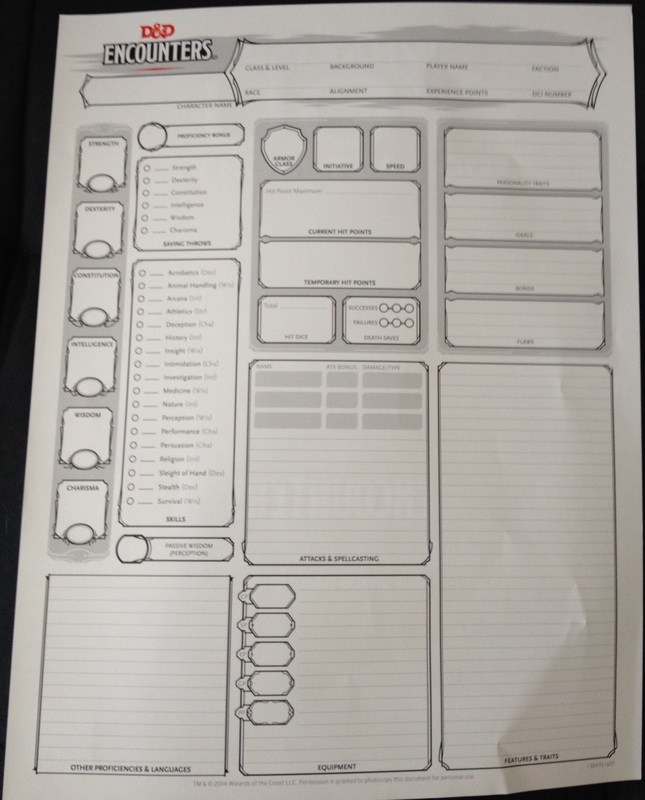 I must admit, I strongly prefer these character sheets to the ones in Ghosts of Dragonspear Castle. Here’s the back of the Elven Mage character sheet. It gives you a lot of background information to help you roleplay the character, as well as some example names for male and female elves. 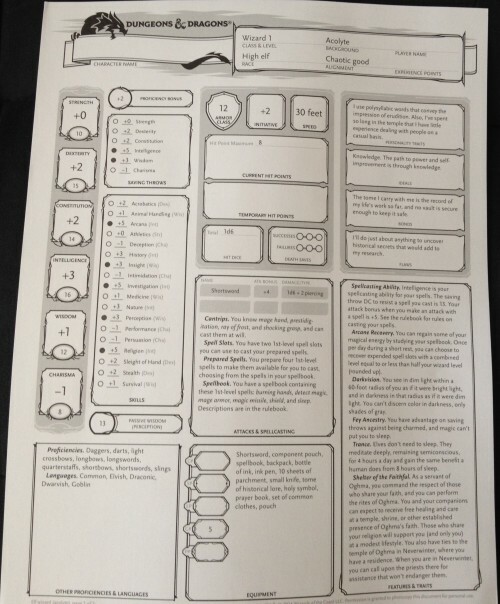 Gender neutral character sheets. Whoo! 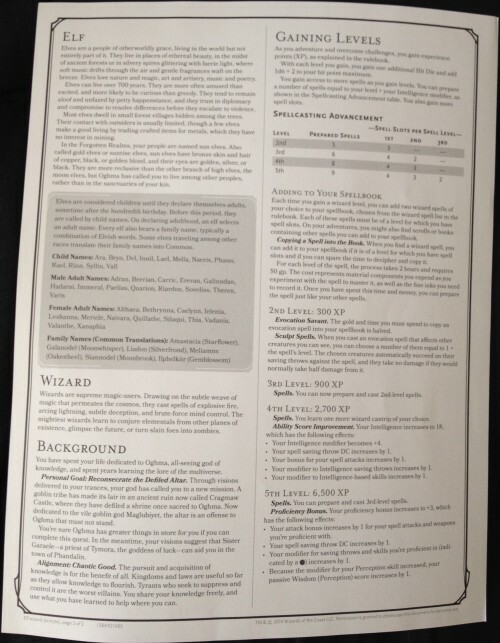 I also like that the back of the sheet gives you information on what your character gets as it levels up. That’s a nice touch, especially for a starter sheet. No having to look up things. It’s all right there. The D&D Starter Set also comes with a blank character sheet for you to either scan in and turn into an editable PDF or just photocopy for you and your friends to fill out. Now, there aren’t any character creation rules in this set. 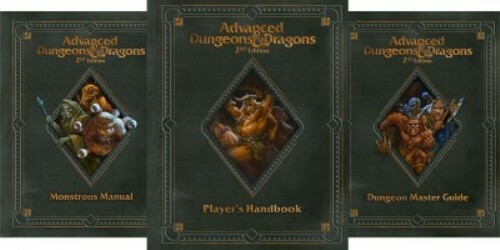 To get those, you’ll need to pick up Basic Dungeons & Dragons, which is a free 110 page PDF. You can download it here. It’s pretty awesome. Finally, here’s one last look of everything that came in the set! 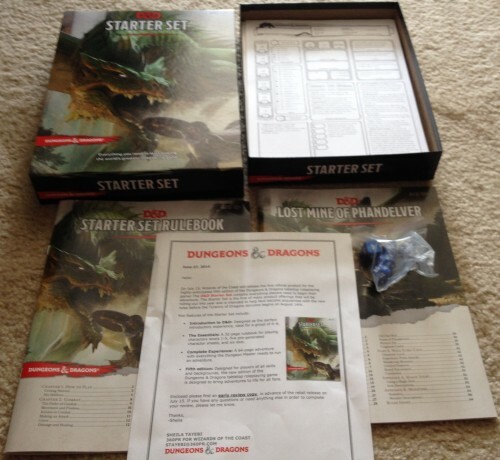 As you can see, the D&D Starter Set is an amazing deal. You get a little bit of the PHB, DMG and MM along with five pregenerated characters and a full campaign to play with your friends! The size of the adventure alone is enough to justify the cost, but getting a swanky box set and a full set of polyhedral dice is just icing on the cake. It’s hard to believe the MSRP on the D&D Starter Set is only $19.99. 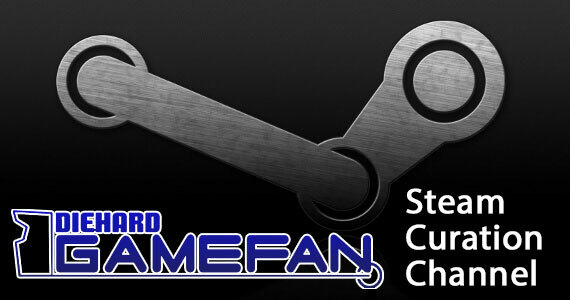 Even better though, you can still preorder it at Amazon.com for only $12.65! I can not express what an amazing deal that is. 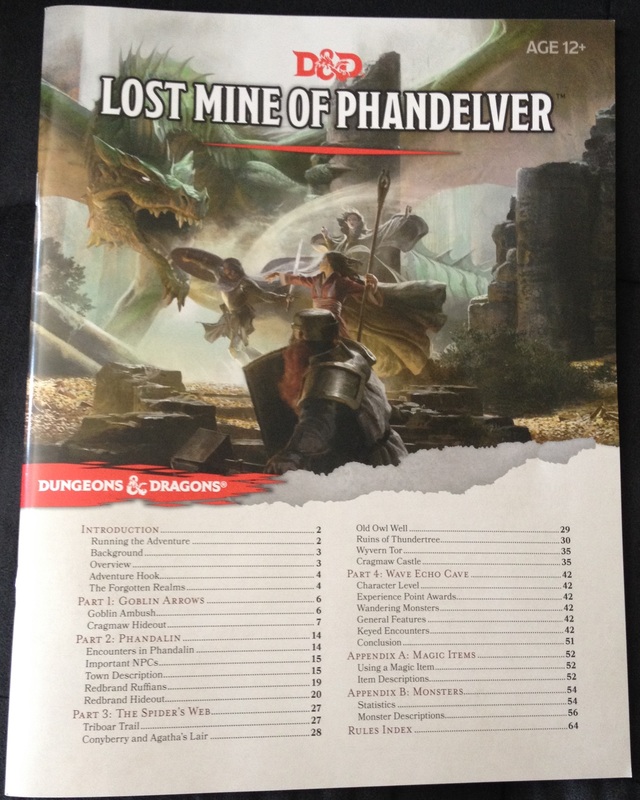 Considering adventures for other games like Pathfinder can run up to $20 (or more! 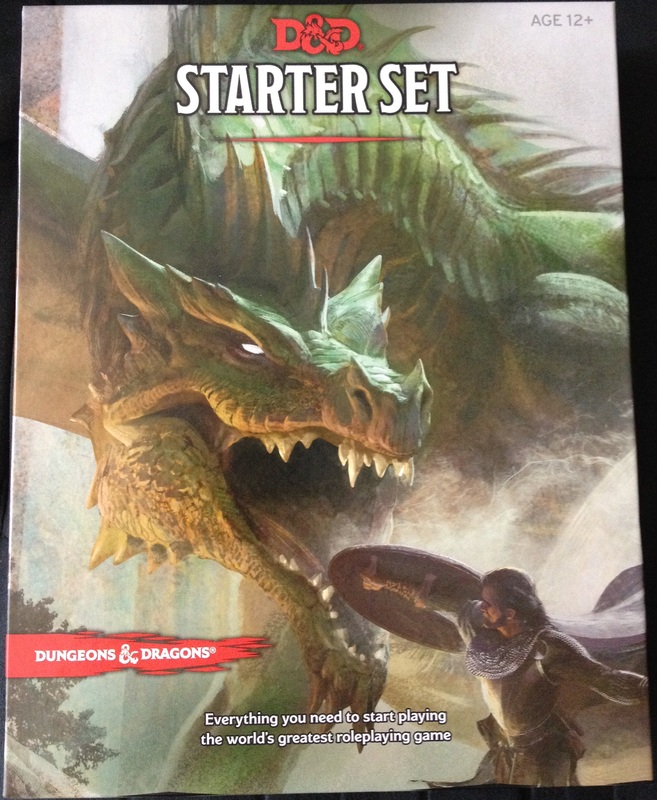 ), any tabletop gamer worth their salt is going to want to pick up this boxed set for the sheer value, not to mention sample what 5e has to offer. Remember, at Amazon, you can buy this for less than the cost of a set of FATE dice, which is insane. What are you waiting for, go pre-order this already! Oh yeah, remember to come back and check out our full reviews of the D&D Starter Set along with closer looks at each individual book. See you then and have a happy Fourth of July weekend!